In 2010, Dr. Radhika received the HMDP scholarship awarded by the Ministry of Health for specialisation in Breast and Reconstructive Surgery. During this time, she trained for a year in the prestigious Nottingham Breast Institute (UK) as an Honorary Clinical Fellow. 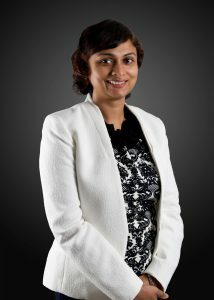 Dr. Radhika has more than 20 years of surgical experience. In 1997, she obtained her MBBS in Singapore. Before joining the private sector, she was a consultant surgeon in the Department of Surgery at Khoo Teck Puat Hospital. In 2012, her passion in clinical teaching placed her as a Clinical Lead in Surgery for Lee Kong Chian School of Medicine, Nanyang Technological University/Imperial College of London. There, she served as an adjunct assistant professor. As an active member of the Singapore Breast Cancer Foundation, she plays a prominent role in various awareness programmes. She is an avid speaker who gives frequent public talks on breast cancer awareness, and has also published several peer-reviewed articles and chapters on cancer-related topics. Dr. Radhika currently practises at her own clinic: SOG – Radhika Breast & General Surgicare, located in Farrer Park Hospital and Parkway East Medical Centre.